Home Costs > How Much Does a Permanent Foundation for a Mobile Home Cost? How Much Does a Permanent Foundation for a Mobile Home Cost? It has been said that a mobile home with a permanent foundation tends to hold its value better when compared to its non-affixed counterparts which simply sit on piers. It also conforms to HUD/FHA compliant permanent foundation guidelines. A mobile/manufactured home can be affixed to a permanent foundation, either when it’s first setup or in the near feature as a retrofit. Permanently setting up your mobile home on a foundation can be done in any situation but is often considered a costly process. 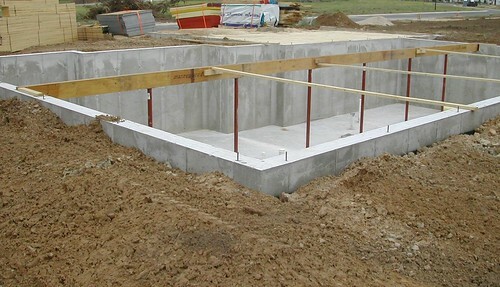 The costs of creating a permanent foundation for your mobile home will greatly vary on so many factors, including the type of foundation, your soil conditions, your geographical location, the home’s condition, the contractor you choose and if any obstacles are foreseen. The biggest culprit, often being the soil, will determine the frost penetration depth, which will determine what kind of foundation is needed and the depth. With so many factors, you can see costs greatly ranging from as little as $9,000 to $25,000 or about $18 to $33 a square foot for a basic concreted-based foundation. Do keep in mind, however, that other fees can occur, which will go into detail below in our “extra costs” section. Since all jobs are going to be very unique, we highly recommend you use HomeAdvisor.com to find contractors in your area who are willing to offer you an exact quote for your project. Here, you simply describe your job via email and multiple licensed contractors will contact you with a quote for free. On this ModularHomeOwners.com blog post, they broke down the costs of their modular home process. In the breakdown, they reportedly paid $22,250 for a full basement foundation. Planning and permits – Laying a foundation will always require a plan, and all mobile home owners will need to abide by the local building codes, meaning you will need inspections from the city and permits as the foundation is being poured and once it’s complete. The average costs of the permits will greatly depend on your geographical location and size of the job, but HomeAdvisor.com recommends budgeting $0.89 a square foot. Soil reports – These reports are necessary as it can help determine what kind of foundation you will need for your project. Structural engineers – A structural engineer will be required to inspect the foundation location before even considered to help spot any weaknesses and/or make some recommendations for any foreseen potential failures. Depending on the engineer being hired and the size of the job, this inspection can average $400 to $1,000. Moving the mobile home – If the mobile home is already on site and needs to be moved, this can be yet another cost to consider. Moving a mobile home, just a few feet from the site, can reach into the four figures. When a mobile home is affixed to a permanent foundation, it is now viewed as a real piece of property rather than a personal piece of property, meaning “real” property, in general, will tend to increase in value over time when compared to a home that isn’t affixed to a permanent foundation. In the future, when you do decide to sell, this will not only be great for your pocketbooks, it can increase the pool of buyers interested in your home. Aside from the potential value increases, a permanent foundation can often qualify for mortgage financing as banks usually will not offer a mortgage for homes not set on a permanent foundation such as a mobile home. This isn’t the case, however, as it will vary from bank to bank and your situation.